Severe bruises can result in a hematoma. Feeling a hard lump under a recent bad bruise can be worrying. The good news is that in most cases of bruising, these lumps are not a cause for concern. 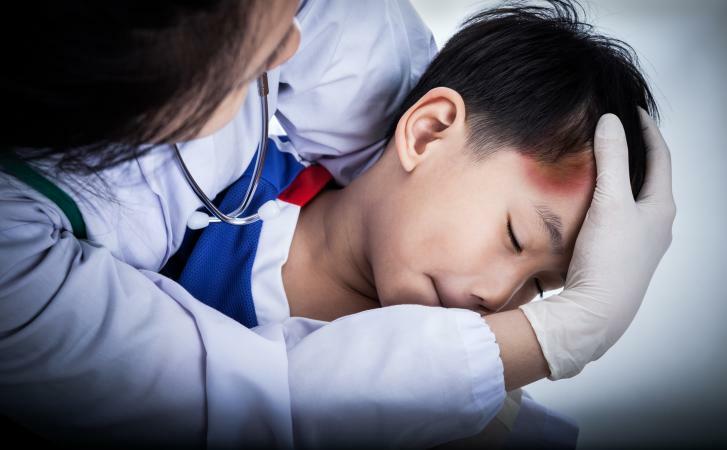 However, there are possible complications from bruises, and when bruising is severe or if this occurs on the head, it is important to be aware and take action. Bruising is common after a fall or bump against a table or door. Typically, bruises occur when there has been an injury to soft tissues under the skin. Blood collects at the location of the injury, and causes distinctive red, purple, or blue coloring to appear. As the bruise heals, it may turn yellow, until it finally resolves after a few weeks. In cases where the bruise is especially bad, a hematoma may form. This is a hard lump that develops at the site of the bruise. Though it feels like a strange bump, it is actually made up of a small amount of blood that has pooled into fatty tissues under the skin. When you push on a hematoma, it may move around under the skin, feeling uncomfortable or even painful. Though these signs and symptoms may be disconcerting, they are not usually a cause for alarm. Usually, the body will eventually reabsorb the blood that formed the hematoma without any need for treatment. Applying a cold pack to the site of the bruise during the first 24-hours. This can decrease the amount of bleeding. It should be done in 20-minute increments, 4 to 8 times in the day. If after two full days, the area still feels painful, apply heat using warm towels or a heating pad. HealthCentral recommends doing this for 20-minutes at a time, followed by a cold compress to minimize swelling. Elevating the bruised limb if at all possible. This will cause blood to leave the area, which may result in reduced swelling. Resting is also important as it can prevent you from making the injury worse. Taking something like acetaminophen can reduce the pain associated with a soft tissue hematoma. Draining is an option to consider if your hematoma is taking a long time to disappear. 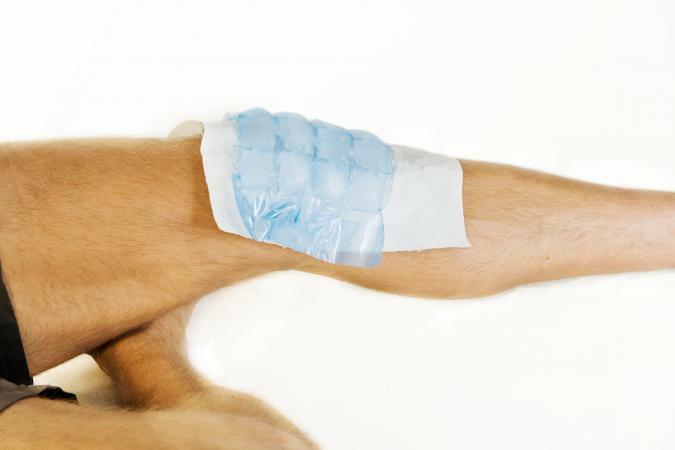 It can speed up the recovery process and reduce any associated pain or discomfort. According to Heal Dove, if a doctor deems in necessary to drain the area, they will make an incision and use a syringe to get rid of any built-up blood. There are some instances when the development of a hematoma may require special care. When a severe accident occurs (for instance, a car accident, sports injury, or a serious fall) it can lead to subdural hematoma, an epidural hematoma, or an intraparenchymal hematoma. Each one can have life-threatening consequences if left unchecked. According to WebMD, subdural hematoma happens when blood vessels rupture between the brain and the outermost layers of membrane. This forms a hematoma that compresses the brain issue - leading to issues like dizziness, headaches, confusion, and even death. These symptoms may appear right away, a few days after an injury, or over a period of weeks. An epidural hematoma on the other hand, happens when a blood vessel ruptures between the skull and the outer surface of dura mater. This forms a mass that can be dangerous if left unchecked. While this type is not as common as the subdural variety, they tend to occur more often in young adults. Symptoms include a loss of consciousness (often followed by regaining consciousness before losing it again), difficulty breathing, headache, seizure, and death. The last type happens when blood begins to pool in the brain. This tends to happen after a major trauma to the head - and there can actually be more than one intraparenchymal hematoma affecting the brain at a time. The Mayo Clinic article on Intracranial Hematoma states that this type of hematoma can cause white matter shear injuries, which often result in brain damage. Surgery. This is a fairly common way to treat hematoma that occurs on the head. In some cases, it will require drainage of the affected area while larger and more severe cases may need craniotomy (where a section of the skull is opened). It depends entirely on the type of hematoma and the severity. Monitoring and Medication. In some instances, the hematoma may be very minor and not require surgery, at least not right away. In those cases, a doctor may choose to monitor the area closely over a period of weeks and months. In addition, they are likely to prescribe blood-thinning medication. 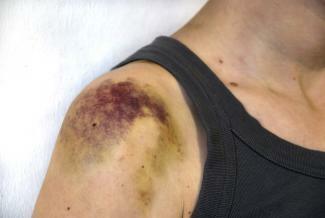 A hematoma that forms after severe bruising does not normally require any treatment. (The exception is when bruising occurs following a head injury.) However, it is important to pay attention to any and all symptoms that appear. If the bruised area is causing significant pain, it continues to be swollen, or the hematoma does not appear to be healing, it may be time to consult with a medical professional. It is common for people, especially those who bruise easily, to not remember the injury that caused a specific bruise. An abnormal number of bruises that occur with no apparent cause should always be discussed with a physician. When it comes to a hard lump under a bruise, there is one question that everyone wants to know: when will it go away? This is different for each person. It can vary dramatically depending on the size and placement of the hematoma as well as the cause of the bruise. Generally speaking, smaller ones heal within five to ten days. Larger hematomas will start to look better after ten days but may last for several weeks. If you see no signs of progress or you feel the hematoma is taking longer than it should to heal, make an appointment with your doctor. He or she can determine whether it is healing properly. Although hematomas are the most common cause of a hard lump under the skin after a serious bruise, there are occasional other instances in which a hard lump forms after a fall, sports injury, or other trauma that causes bruising. This occurs when there is a deep bruise that causes trauma to the bone in the area under around where the bruising occurs. A bone bruise occurs when blood pools underneath the periosteum, a thin layer of tissue that covers a bone. According to St. Luke's Hospital, this is referred to as a subperiosteal hematoma, and can be diagnosed using magnetic resonance imaging (MRI) technology. This type of injury is often more painful than a standard hematoma that occurs after a bruise and may include stiffness. Although not as severe as a fracture, most bone bruises take one to two months or more to heal. In addition standard bruise treatment, a bone bruise might require the use of wearing a brace of other device to limit movement and allow the area to heal. While most bone bruises heal without complications, avascular necrosis is a possible complication that could cause part of the bone tissue to die. This is more likely to happen with bone bruises that are very large. It is wise to seek the advice of a healthcare professional if you suspect bone bruising. Most commonly associated with serious sports injuries, myositis ossificans is another possible complication of bruising that can cause a hard lump or hardened area. This is caused by abnormal bone tissue growth inside muscle tissue after the area is badly injured or after repetitive sports injuries. While a hematoma often appears relatively soon after a bad bruise, this abnormal bone tissue growth within the muscle may not occur until two to three weeks following an injury. It is characterized by hardness and pain, and can limit the range of motion and mobility of the injured person. Elevating and treating the area with ice to prevent swelling and encourage healing is important immediately after the injury occurs. As the area heals, light stretching is also important as myositis ossificans is more likely to occur in muscles that remain sedentary. According to Summit Medical Group, this condition often heals naturally anywhere from a few months to a year, but sometimes surgery is necessary. In many cases, there's no need to worry about a hard lump under a bruise, and the lump will resolve without any treatment. All you need to do is give it time to heal - and focus on minimizing the symptoms. In any circumstance where you are concerned, however, seeking the care of your doctor can help put ensure there are no complications from your bruise.